Michael Imhoff: SQL Server 2000 on Vista? Thanks - I just upgraded to Vista and forgot to detach my SQL 2000 databases but, thanks to your blog, I can now access them under Vista! How did you get the install program to run? Mine keeps telling me that I have to reboot to finish off another installation. It turns out that because Office 2007 was preinstalled with SQL Server 2005 Express edition, this confuses the SQL 2000 setup. I can't reinstall Vista because it came preinstalled on my laptop, so I'm forced to use SQL Server 2008 Express edition, which is a real pain. I am shailaja, i just bought a pc with windows vista (home basic). Now i am trying to install Sql Server 2000 but at the end of the installation it displaying the message as "Installshield has stopped working". Happy to hear that Sql Server 2000 is able to install in vista. So Can you please help to resolve the problem. You might want to ensure that you're running the install program "as an administrator". I wish I could be of more help, but there are quite a few resources out there. Have a look at this link. I had some problems connecting to the instance installed on vista but once i had installed the sp4 every thing is working fine . 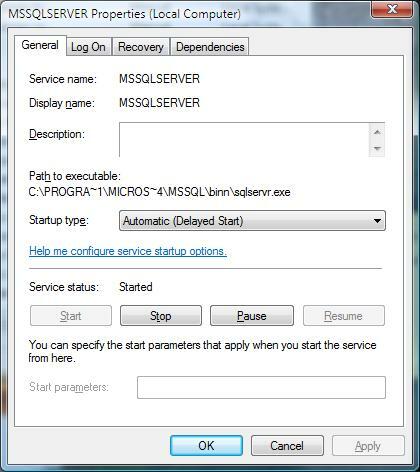 Vista support SQL SERVER 20. Please guide me, how can I install SQL Server 2000 (Developer) on Vista Business edition. "installshield engine has stopped working"
can someone please explain how to do this? thanks..